President Rodrigo Duterte visited the remains of the soldiers at the Eastern Mindanao Command (EASTMINCOM) Gymnasium Davao City on Thursdays, February 17, 2017. The President cried after he saw the remains of Naval Station Felix Apolinario and Corporal Michael Yadao, that killed by the NPA Terrorist. Several soldiers killed including Mr. Yadao, Mr. Apolinario and 17 others were wounded by the attacks. Recently, President Duterte end to peace talks between the government and CPP-NPA-NDF because of several attacks by the terrorist group. 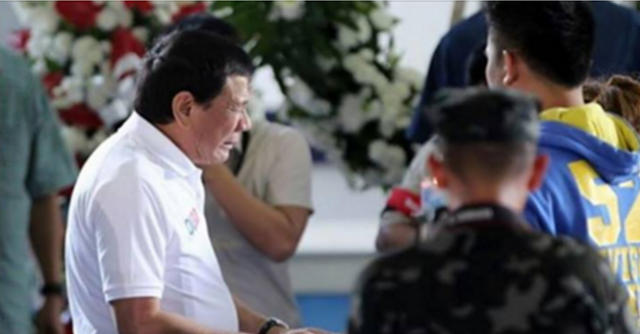 Another picture of President Duterte cried was captured by Davao’s photographer. The first time that he cried in public was when he won the Presidency and visited his parent’s grave. “Vicente Joseph Collamat Oplas: Your emoton touch our hearts President. It really hurts when you are in grief. But rest assured. Kami po ay nandito para damayan ka sa inyong pagluluksa. Stella Marie: Felt his pain, from a father whose so strong, full of humor and simplicity, to see him sobbing is extremely painful. The picture says “vengeance is ours, rest now my son for the future of your children is clear”. ***************************************************** Thank you so much for sharing a bit of your precious time to read this blog site. You can SHARE this now with your family and friends on FACEBOOK or TWEET it on TWITTER to get others informed about it.